Michael Clarke Duncan (December 10, 1957 – September 3, 2012) was an American actor who starred in movies and was a guest on television shows including: Two and a Half Men, The Suite Life of Zack and Cody, CSI: NY and Chuck. Before he became an actor, Duncan was a bodyguard for celebrities including: LL Cool J, Jamie Foxx, Martin Lawrence, Will Smith and The Notorious B.I.G.. He quit because when his friend covered for him while watching Notorious B.I.G., Biggie died that night. Duncan became friends with Bruce Willis while he was acting with him in the movie Armageddon, This helped him get the role of "John Coffey" in The Green Mile. After getting that role he became a breakout star. Duncan had a heart attack on July 13, 2012 and was rushed to the hospital. On September 3, 2012, at 7:00 am, his publicist quoted Duncan's fiancée, Omarosa Manigault-Stallworth as saying that Duncan had died that morning at the age of 54. 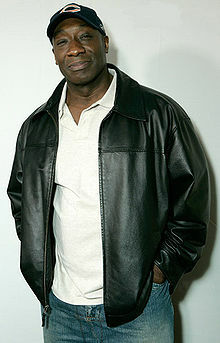 ↑ "'Green Mile' actor Michael Clarke Duncan dead at age 54, family rep says". This page was last changed on 9 April 2019, at 20:40.